My Pumpkin Roof is more than just a catchy title. The product of Aurovillian Martin Scherflera��s extensive gardening experience, the book is both a call to action and a practical guide, which should resonate with city-dwellers concerned about the quality of their food. Growing up in rural Austria, with parents from a farming background, a�?growing your owna�� is a way of life for Scherfler. a�?I didna��t appreciate how lucky I was when I was made to work in the garden as a chore,a�? he jokes, adding that he only realised the value of home-grown food when he apprenticed as a chef and began to notice the massive deficiency in the taste and smell of commercially-grown products. 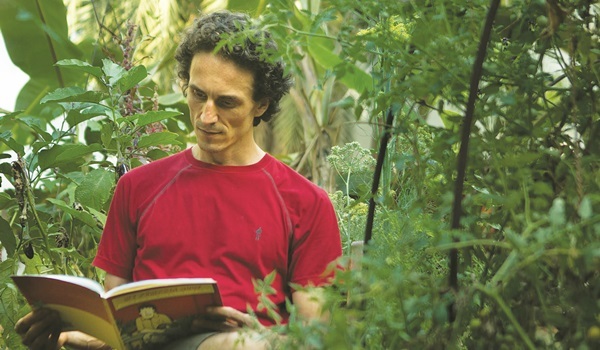 Since re-locating to Auroville in 2007, hea��s had the space to indulge his passion and learned to adapt his skills to a tropical climate. Scherfler first came to India as part of an Austrian government year-long a�?social servicea�� programme that saw him working with widows in Himachal Pradesh. Intrigued by Auroville, after a brief visit in 2001, he decided to spend a few months in the community before returning to Europe for his PhD. a�?A few months turned into a few more, and I decided to stay permanently in 2007,a�? he shares. Since then, he found his niche co-founding Auroville Consulting, which advises institutions on ecological sustainability. a�?In my day job, I preach sustainability so I also have to live it. Gardening is one of the easiest ways to do that. It requires little investment, and you learn by trial and error,a�? he says. At the moment, Scherfler is enjoying the summer harvest, with a bounty of tomatoes, long beans, brinjal and okra, which he shares with his neighbours and colleagues, who are then often inspired to start a garden of their own. He hopes that the book, with illustrations inspired by Tamil pop art by illustrator Navleen Kohli, will have a broad appeal, taking that inspiration beyond his own community. There areA� sections on the benefits and history of the urban agriculture movement, as well as practical advice onA� what to plant and when, tips on containers and tools, a guide to organic pest control, and even recipe suggestions. a�?Ita��s a book that you can open up and begin at any page,a�? says Scherfler. And with real issues like food inflation and scarcity linked to population growth, he feels it will have wide resonance.